Cheese consumption begins at breakfast in Turkey, where it's most often the main course, and continues throughout the day. Turkish meat dishes like "kasarlı kofte" (kah-SHAR'-luh Kuf-TAY') combine meat and cheese. Cheese is also served as a starter, or "meze," with fish and meat entrees. Crumbled or grated cheese is also added to salads. 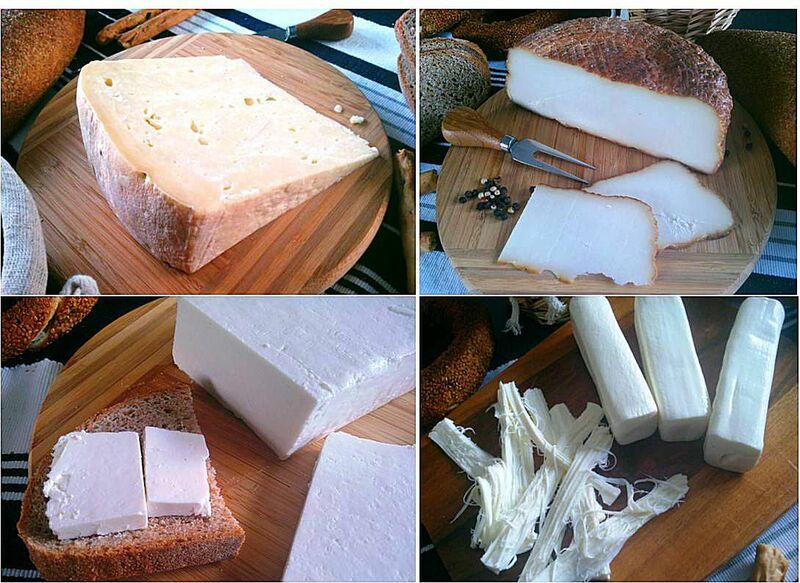 The most common cheeses in Turkey are fresh white cheeses, or "beyaz peynir" (bay-AHZ' PAY-neer). These cheeses are similar to feta. White cheese is a staple at breakfast, as a filling in layered pastries and other baked goods, in salads and as an appetizer or cheese platter. The best white cheeses come from Thrace and the areas surrounding the Sea of Marmara, but white cheese is produced all over the country. It can be made with cow, sheep or goat's milk. Another popular cheese common in Turkey and Greece is called "'taze kasar"(tah-ZEH' kah-SHAR'), which means kashar cheese that hasn't been aged. Fresh kashar is a smooth, firm, light yellow cheese usually made from cow's milk. It's a very versatile cheese good for slicing, melting, grating or eating straight up. It most often accompanies white cheese at breakfast. It's also used on pizzas, in sandwiches and salads and as the main ingredient in Turkey's classic comfort food, "tost." In English, it's called a grilled cheese sandwich. The city of Kars, in the northeastern region of Turkey, is most famous for producing Turkey's ​best-aged kashar cheese, or "eski kasar" (es-KEE' ka-SHAR'). The Kars variety of this beloved cheese is usually made with pure cow's milk or a mixture of cow and goat's milk. As the cheese ages, it forms a crust and mold on the exterior. The inside becomes dry and flaky. Its flavor most resembles Italy's Romano cheese, with even more tang, rich odor, and flavor. Aged kashar is ideal for grating and is most often eaten at breakfast, as part of a cheese platter, or grated as a topping or filling in many dishes. 'Tulum' (TOO'-loom) is general term used for a pungent, soft, sometimes crumbly form of white cheese made from goat's milk that varies greatly between regions. Branded versions of tulum that are sold in the supermarkets are uniform in type and sold across Turkey. Tulum is best served as an appetizer before meat fare. The traditional way is to serve crumbled tulum with walnut halves, sweet butter, and piping hot lavash flatbread before a plate of spicy kebabs. Smoked cheese is produced in the areas surrounding Duzce and Hendek in the Marmara region of Turkey. This cheese gets its robust flavor in special smokehouses that burn pine. This cheese has a wonderful aroma and rich, smoky flavor. It comes in wheels covered by a light brown, textured hull. Smoked cheese is normally eaten on its own or melted into sauces. This fresh, white, stringy cheese, called "dil peyniri" (DEEL' pay-NEAR'-ee), must be eaten within a day or two. It's most often sold in rectangular logs and pulled apart in stringy strips or cut in chunks. Like mozzarella cheese, fresh dil is wet and has the best fresh, milky flavor in the first few days after production. Also like mozzarella, dil becomes very stringy when melted. That's why in Turkey, it's not the preferred cheese for use on pizza, taking a second seat to fresh kashar cheese. Fresh dil is usually eaten for breakfast, and children love it because of its mild flavor. Plaited cheese, or "orgu peyniri" (euyr-GOO' pay-NEAR'-ee), began as a regional cheese from the areas near Diyarbakır in the southeastern region of Turkey. It is a hard, uniform, salty cheese made with cow's milk. It's a contender at the Turkish breakfast table and is used as an ingredient in some Turkish appetizers. "Labne" ( lahb-NAY') is a bright white, fresh, spreadable cheese sold in tubs. It most resembles cream cheese but is much lighter in texture. "Labne" is yet another rich addition to the Turkish breakfast table and is especially loved by children. Like cream cheese, it is also used in many desserts, savory pastries, pies, and hors d'oeuvres. "Lor" (LORE') is a low-salt, low-fat form of white cheese with a high protein content. That makes it a favorite with health-conscious folks, those recovering from an illness and even body-builders. "Lor" is also inexpensive and is used to make lighter versions of traditional Turkish layered pastry and cheese pies and desserts.